Golok Serta Rinpoche (1891-1963 or 1964) (also known as Pema Lungtok Gyatso (Tib. པདྨ་ལུང་རྟོགས་རྒྱ་མཚོ་, Wyl. pad+ma lung rtogs rgya mtsho) was a great Chö practitioner of the Dudjom Tersar lineage. Trained by Goser Onpo Khyenrab Gyasto Rinpoche and Degyal Rinpoche, two senior direct students of Dudjom Lingpa, he became one of the principal lineage holder of the Chö practice of the Tröma Nakmo cycle of the Dudjom Tersar, especially in the Western part of Tibet. Golok Serta Rinpoche was born in 1891 in Golok Serta, a part of Eastern Tibet. In 1899, when he was 8 years old, he was blessed by the great tertön Dudjom Lingpa who had established his encampment in this area. Golok Serta Rinpoche was later recognized as an emanation of Yudra Nyingpo. As this teacher was also a close disciple of Dudjom Lingpa, he handed down the Tröma Nakmo cycle of teachings to the young monk who achieved the 500,000 accumulations of the ngondrö in Shukgang hermitage, staying there during about two years. Golok Serta Rinpoche was attracted by the anchorite life because he thought that life in monastery was a source of too many distractions which disturbed Dharma practice, all the more so as he was given the responsibility of being Shyichen Monastery steward. As he wasn’t authorized to stay in Shukgang hermitage, he met Goser Onpo Khyenrap Gyasto Rinpoche secretly and requested to him permission to leave the monastery in order to devote his life to the meditation in the renunciate vagabond style. Seeing his resoluteness, the teacher authorized him to leave. Thus, in 1910, he undertook a pilgrimage to central Tibet. Along the way, he met Adzom Drukpa and stayed three months long in his encampment, becoming then renowned as Golok Serta Rinpoche. At the encampment of Adzom Drukpa, he trained in the ngöndro practices and studied such texts as “The Oral Transmission of The Guru Samanthabadra” and “The Lamp Illuminating the Path to Liberation”. It is said that by putting these into practice, he gave rise to qualities that reflected the progress he had made on the spiritual path. One day, Adzom Drukpa told him “If I instruct you in the main body of practice of the Dzogchen approach, you must go to western Tibet and benefit beings there”. Adzom Drukpa Drodul Pawo Dorje’s son having to go to Lhassa with other tulkus and lamas, Golok Serta Rinpoche joined their caravan and used this opportunity to meet Tokden Shakya Shri. In Lhassa, he paid homage to the various sacred sites and practiced Chö in remote places of Central Tibet. In 1912, while he was 22 years old, Golok Serta Rinpoche met Urgyen Jigme Chökyi Senge Rinpoche, a lama coming from the same native land than him and holder of the Longchen Nyingtik lineage, who was then living in Tsering Jong , in the Yarlung area, the place where had stayed Jikme Lingpa in the past. Under his guidance, Golok Serta Rinpoche practised diligently the preliminaries and the creation stage of the Three Roots during several years. It is said that  “His strong involvement in meditation practice rejoiced a lot his lama but, in the same time, stirred up jealously in the mind of some other disciples. Then, in order for the samayas to not be damaged in the sangha, Golok Serta Rinpoche preferred to leave”. Moving from south to the north of central Tibet, he meditated in remote places and begged his food among the nomads. Staying one month long in Tsurphu Monastery, he was blessed by the Karmapa Khakhyap Dorje. 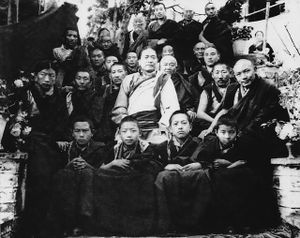 In 1920, he received blessings and transmissions from Drikung Kyabgön. The following year, he went for pilgrimage in Nepal and, on the way back, he met Tsogkhang Rinpoche, a student of Dudjom Lingpa, who was also from Golok. In 1923, he walked to the region of Ngari in western Tibet and reached the foot of Mount Kailash. In Thrügolho, a Drikung Kagyü monastery, he heard for the first time of Degyal Rinpoche, a lama from Golok who had been a student of Dudjom Lingpa. Whishing to meet him, he went to the hermitage of Namkha Khyung Dzong, the “Space Garuda Fortress”, met Degyal Rinpoche, and became one of his disciples. Degyal Rinpoche and Golok Serta Rinpoche were from the same birthplace and the same Dudjom Tersar lineage. From then on, Golok Serta Rinpoche relied on Degyal Rinpoche as his main master and remained with him. Golok Serta Rinpoche devoted all the rest of his life to put his teacher’s instructions into practice through intensive retreats. He accomplished a three years retreat in a hermitage with the help of his first student, Pema Kundröl Gyalpo, who provided him food and water he carried from afar, sparing no effort to help him. It is also said that Golok Serta Rinpoche “then visited more than a hundred springs and other isolated, haunted places, becoming a mendicant with no fixed abode”. Through the teachings from the Tröma Nakmo cycle of Dudjom Lingpa and from the Nyingtik section of Dzogchen, Degyal Rinpoche and Golok Serta Rinpoche brought great benefits to beings throughout the three areas of Ngari, as well as in Nepal and on all of the foothills of the Himalayas. In Muktinath, Nepal, Golok Serta Rinpoche was welcomed by Lama Jampal Rabgye and taught there to many lamas, monks, nuns and lay people. On this occasion, it is said that a new water-spring appeared miraculously. In 1933, while he was teaching one more time in Muktinath, he understood that Degyal Rinpoche had just passed away. He quickly came back to Namkha Khyung Dzong to pay homage to the dead body of his teacher. Thinking that it should bring benefits in the future, the main students of Degyal Rinpoche decided to erect a reliquary stupa to keep the embalmed body of Degyal Rinpoche. Golok Serta Rinpoche took responsibility for collecting sandalwood and aloe from Nepal. He brought back about 25 kilos of wood along with many precious stones given by his benefactors, thus contributing to spread his fame. In 1934, the stupa was achieved and one temple was built. Thus, little by little, the hermitage turned into a monastery. From this time one, Golok Sertar Rinpoche was requested to teach in Namkha Khyung Dzong. In 1936, he settled down on the bank of Rakshas Tal Lake, next to Lake Manasarovar, in a old an disused small monastery named Tsegya Gön, which he undertook to restore. On the following year, a son was born to him who appeared to be Degyal Rinpoche’s rebirth. Officially recognized in 1939, the child was enthroned and named Pema Jigme Chöying Rangröl, the Second Degyal Rinpoche. During the year, Golok Serta Rinpoche divided his time in two main parts: secluded retreats during winter, and teaching Dharma during summer in Namkha Khyung Dzong or in different Himalayan places of Nepal, like Humla, Hikim, Mustang and Dolpo. His accomplishments attracted many disciples and benefactors but he contented himself with only the bare minimum. He used mainly the donations to help Namkha Khyung Dzong which had become a great religious center for monks, nuns and ngakpas. In 1943, he collected timber to build a large assembly hall. In 1946, Golok Serta Rinpoche went for a pilgrimage to India, visiting Bodhgaya and Benares, and traveling all across the Himalayan mountains. His wife died while he was on the way back home. When the Nepalese region Hikim was overwhelmed by the drought, it is said that Golok Serta Rinpoche brought forth a source by his yogic powers, thereby saving the lives of the villagers and their animals. He did the same in Mustang and in other places, which led him to be called “Pani Lama”, which means “Lama of Water”. In addition, this allowed to reduce considerably the tradition of animal sacrifices in the valleys of the Himalayas. In 1953, he visited again India and went to the sacred lake of Tso Pema, then to Lahaul and Spiti. He came one more time in this country in 1955. Also, he contributed to the building of a big prayer wheel in Namkha Khyung Dzong and led the consecration ceremony. In 1959, the tragic events in Tibet led him to leave the country for India with his retinue and he arrived in a refugee camp in Sandew (Uttar Pradesh), in India, where about one thousand Tibetans were gathered. In Tibet, Namkha Khyung Dzong monastery was completely destroyed by the Chinese. In 1961, he left his camp in India to make a pilgrimage to the sacred places of Buddhism. He also went to Kalimpong, in India, to meet for the first time Dudjom Rinpoche, who was then giving the transmission of the Nyingma Kama. It was on this occasion that Dudjom Rinpoche put him on a throne and introduced him to all participants, calling him 'Serta Drupchen', the great accomplished one from Serta. Afterwards, Golok Serta Rinpoche lived in a Tibetan settlement in Orissa. Shiva Rinpoche, the reincarnation of Golok Serta Rinpoche. Golok Sertar Rinpoche’s activity was maintained by his sons, Choktrul Tsewang Rinpoche and the Second Degyal Rinpoche, benefiting beings in Nepal, Dzomnang, Karmo Rong, and the area around Mount Kalaish in western Tibet, with a special focus on the Chö cycle of the Tröma Nakmo of the Dudjom Tersar lineage. Oral lineage stories say that Golok Serta Rinpoche had the power to read the minds of people, was a wrathful yogi, and that people used to be very careful and check their minds around him. In October 1963, Golok Serta Rinpoche passed away at the age of 72, staying two days long in tukdam. It is said that during the cremation ceremony, many wonderful signs occurred. Later, his relics were put into a stupa in Newal Thang, the monastery he had huilt in Humla. Golok Serta Rinpoche's tulku has been recognized as Shiva Rinpoche, his own grand-son, the son of Second Degyal Rinpoche. ↑ According to Getse Rinpoche, "Golok Serta Rinpoche is not the same person as Pema Lungtok Gyatso who wrote the Chö commentary, even though he was also called Pema Lungtok Gyatso. The mahasiddha who wrote the Chö commentary was actually born in 1852, and we don't know when he died. He did study directly with Dudjom Lingpa." Information provided by Lama Chonam from a conversation he had with Getse Rinpoche on May 2004. ↑ Much of the information provided here is based on the biography of Golok Serta Rinpoche used within Shiva Rinpoche's sangha. ↑ See Counsels from My Heart, Dudjom Rinpoche, page 31. 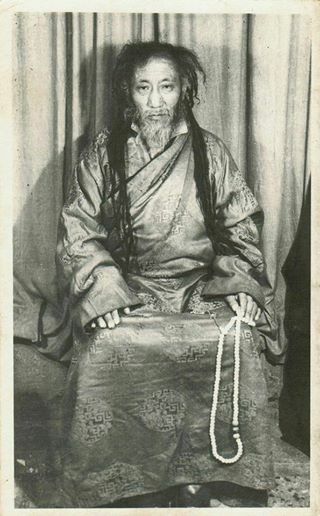 ↑ Lama Katak Rigzin Dorje was the father of Lama Pema Dorje Rinpoche of of Dawa Chödak Rinpoche. ↑ Lama Thikchok Dorje was the father of Lama Yeshi Phuntsok. ↑ A ngakpa who stayed in Namkha Khyung Dzong monastery and practiced also Tibetan medicine and astrology (information provided by Tsering Thondup). This page was last edited on 26 January 2019, at 07:54.